healthytrading: Singapore Property Cooling Measures - Buy on Dip? Singapore Property Cooling Measures - Buy on Dip? Mass market residential property to be worst hit given the additional measures aimed to further curb speculation in this category by hot money flowing through the financial system. Measures seem most drastic in the 7th round of property cooling but as with all past measures, it has shown that the government's steps have been well balanced and aimed to prevent a sudden collapse in prices in the near future should monetary easing start to reduce worldwide. Going by history, as long as hot money is kept circulating in the global financial system (highly likely given the tepid growth experienced in US and Europe), property counters will still enjoy upside albeit less pronounced in the near future. Effects of measures present a buying opportunity to accumulate property counters. Gap down on Monday, first day of the week, declining to a day low of $3.61 before returning to $3.73. 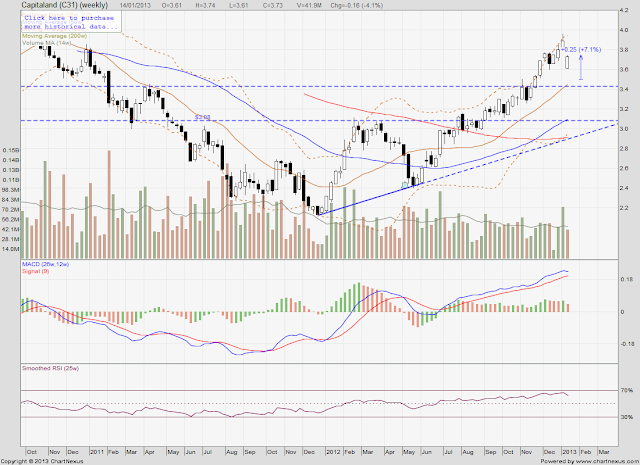 MACD - positive divergence declining and MACD turned downwards for the first time in 6 months. RSI (25w) - hit 70% to face resistance. Would be buyers at ~$3.45 after testing $3.42 key support to catch the property momentum.